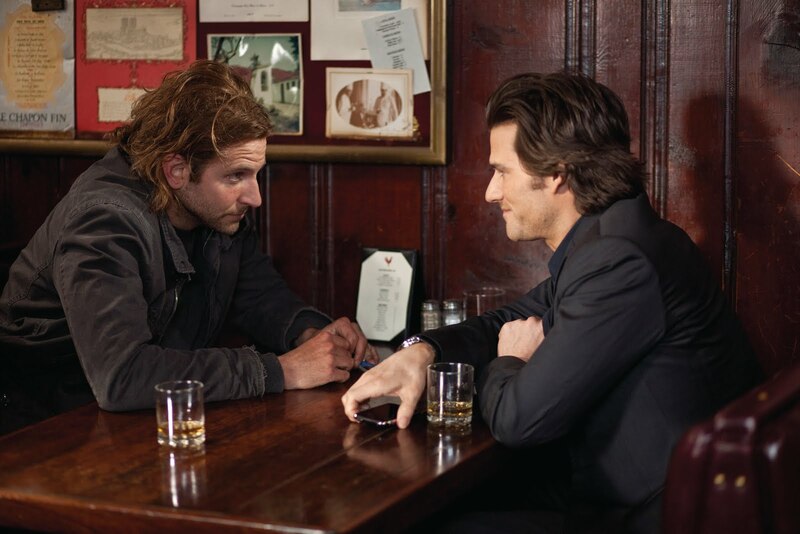 Eddie (Bradley Cooper, left) is about to have his life changed by former brother-in-law, Vernon (Johnny Whitworth), in "Limitless." Photos by John Baer/Dark Fields Production, LLC. 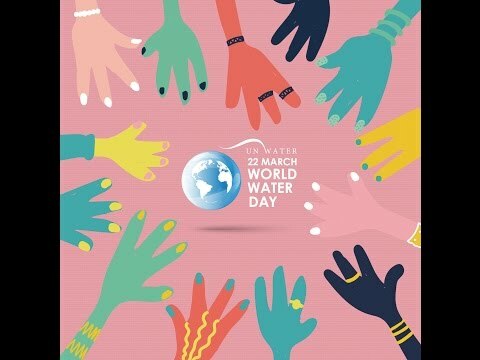 It is human nature to wax thus in the face of various and sundry unpleasant circumstances, not really expecting that there is really such a thing. Now there is: MDT. Where we humans normally use only 20 percent of our brain power, MDT allows us to use all of it! The pill synthesizes everything thing we have learned/seen and catalogs it to be recalled at the just the right moment, enabling us to become perfectly proficient in endless ways. This is precisely what happens in “Limitless” to Eddie Morra (Bradley Cooper), a down-on-his-luck New York writer who goes from a bum’s existence to living extra-special large. Based on Alan Glynn’s “The Dark Fields,” it opens nationwide today. With MDT in his system, Eddie can speak Mandarin and Italian fluently. His facility of karate and boxing are on par with that for Bruce Lee and Muhammad Ali, respectively. It spawns in him mathematical genius. It enhances his organizational skills and increases his motivation. On MDT, he wins his ex back. He becomes a perfect version of himself. Eddie is walking aimlessly down the street one day after his girlfriend, Lindy (Abbie Cornish) breaks up with him. He runs into his former brother-in-law, Vernon (Johnny Whitworth), a former illegal drug dealer who now deals in legal drugs, some of which are awaiting FDA approval. A creature of habit, he is dispensing at least one – MDT – without benefit of a seal of approval. He leaves his card and one MDT ($800 a pop) with Eddie. Under the influence of MDT, Eddie encounters his landlord’s wife outside his door. She is not happy. At first, she is far removed from him, a series of bulging eyes and gaping mouth – as if she is talking to someone else – before she comes back into focus. He was blind, but now he sees. Lindy (Abbie Cornish) out to dinner with a new and improved Eddie (Bradley Cooper) in "Limitless." Repurposed, Eddie recognizes one of the law books she is carrying. He is familiar because his ex-wife studied from the same. How did he remember that? Eddie advises the landlord’s wife about the book, writes a paper for her, beds her and she goes on her way. Back rent is forgotten. Meanwhile, Eddie is a new man. He addresses his filthy, dingy, dirty apartment and completes several chapters of his book, which he places on the desk of his dubious and dumbfounded editor. BC is tall, fair and good-looking. He has the face and bearing of a leading man, yet there is at the same time something slight about him. Here is a man who would let his woman see him cry, though maybe she wishes he wouldn’t. He’s more pretty than handsome. Virility does not ooze from his as it does, say Daniel Craig, Christian Beale and Matthew Matthew McConaughey, who also has a film opening today (“The Lincoln Lawyer”). As Eddie, though, BC is a competent lead. He is also likable and credible. It is easy to imagine him as a writer whose life is about to undergo a cataclysmic change. BC comports himself admirably in one of his strongest roles to date. In “Limitless,” he also has an executive producer’s credit which explains in part why he has top billing over Robert DeNiro who probably appeared in the film as a favor to the kid. To complete his book, Eddie realizes he needs more MDT because the breathtaking brilliance he had yesterday is gone today. In its place is the familiar block. He goes in search of Vernon and finds him at home with bruises on his face and an air of nonchalance. Before he will give Eddie more MDT he sends him out to pick up his dry cleaning and breakfast. Eddie returns to find Vernon’s apartment ransacked and him murdered. 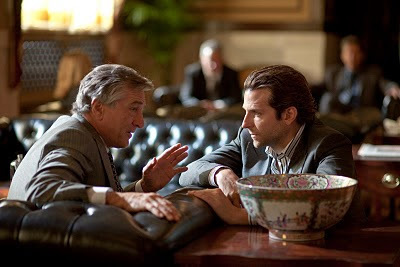 Financier Carl Van Loon (Robert DeNiro) sees Eddie (Bradley Cooper) as a cash cow in "Limitless." While Eddie is freaked out, he had the presence of mind to both call the police and to look for Vernon’s MDT stash. He finds the stash and some cash in the stove. When the police arrive he goes with them to the precinct to give a statement, but that is not quite the end of the matter. Eddie returns to being his best self. He finishes his book and renegotiates his advance. A makeover transforms him into a replica of a GQ cover model. New threads on his back and a few bucks in his pockets, he embarks on a brief, successful career as a poker ace. Eddie's desire to make more money faster leads him to an Eastern European and/or Russian loan shark (Andrew Howard). Do not take MDT, however, if you are not already smart; it won’t work for dumb-dumbs. Eddie (Bradley Cooper) makes a deal with the devil (Andrew Howard) in "Limitless." It is through one of Eddie’s acquaintances that he comes to the notice of Carl Van Loon, a wealthy, (naturally) ruthless, hardscrabble business magnate played with the expected amount of vigor and swagger by RDeN. He and BC play off of each other well. Van Loon wants to exploit Eddie’s talents for defying the odds on Wall Street, which helped the novice amass $2.3 million in 10 days. As he rises nearer the top, though, Eddie is in increasing danger both from MDT and those on his tail who know he has the drug and want it for themselves. Surely, his fall is imminent because his meteoric rise is as artificial as a ponzi scheme, no? He’s a drug addict. No doubt, he’s going to crash and burn – yeah? “Limitless” is a thrilling ride with a satisfying end that leaves the door open for a sequel.